In his first speech to Congress last February, President Trump revived a common misconception about drug regulation. The president’s comments reflect a perennial critique of the FDA, that the agency’s drug regulations impede timely access to new medicines. A few years ago, Friends of Cancer Research (Friends) explored whether these claims were true about cancer drugs. 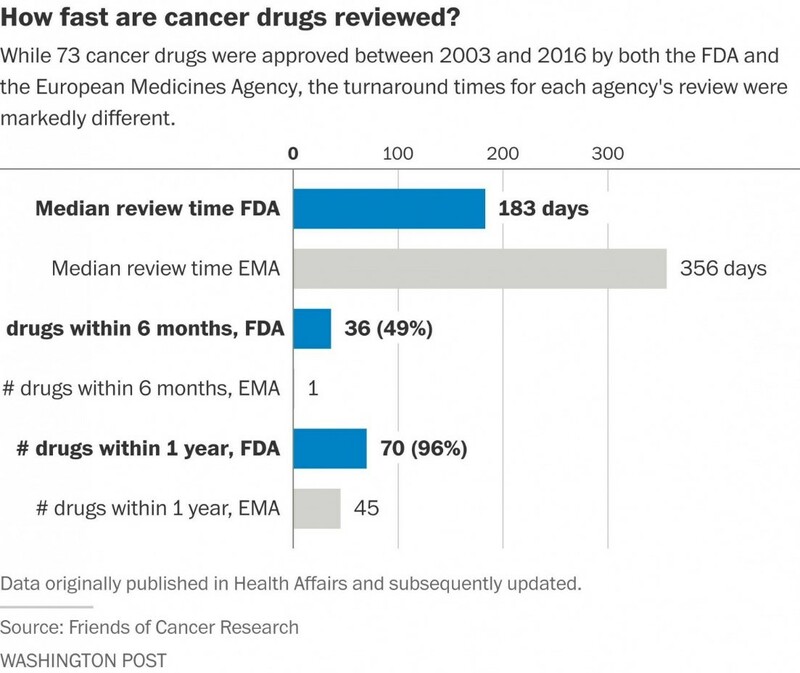 We compared the time the FDA takes to review new cancer drugs with the time it takes European regulators to accomplish the same task. We found that, in just about every case, the FDA moved faster than its European counterpart, which led to drugs being made available in the US first. Following President Trump’s speech, we updated our research to demonstrate that the pattern still holds. The Washington Post cited our research in its coverage of the president’s remarks and created a helpful visual using our data (shown below) to illustrate the FDA’s efficiency compared with European regulators. Here’s some background on the initial research we did. In 2011, Friends published a report in the journal Health Affairs showing that the FDA approves cancer drugs faster than its regulatory counterpart in Europe, the European Medicines Agency (EMA). The report addressed the claim that most drugs become available in other countries before the United States. At the time, the belief was widespread, having been mentioned in the trade press and newspaper op-eds. When we looked at cancer drugs, the data proved the opposite – of the 23 drugs approved by both American and European regulatory authorities between 2003 and 2010, all were available to patients in the US first. In fact, the review times in the US were on average six month shorter than in Europe. 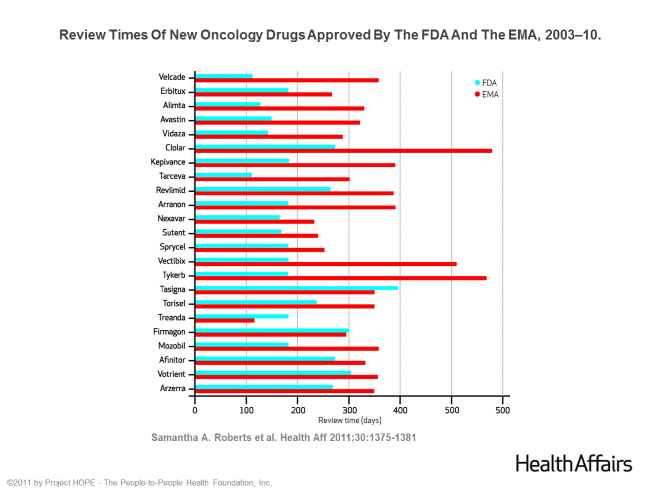 Below is a chart we created showing review times of drugs approved by both the FDA and EMA over a seven-year period. Our research, when it was published in 2011, helped challenge false assumptions about the efficiency of FDA’s approval system. The Friends report gave the FDA’s leadership an important tool to demonstrate the positive impact of recent programs to make drug review more efficient, allowing then commissioner, Margaret Hamburg, to cite the findings in a July 2011 testimony before Congress lauding the achievements of legislation that provides timely patient access to new therapies. The legislation that Commissioner Hamburg noted in her testimony was the Prescription Drug User Fee Act, commonly referred to as PDUFA. In 1992, Congress responded to what were then legitimate concerns over the FDA’s ability to conduct timely drug reviews. The agency did not have the resources or expertise to handle the influx of new drug applications, and review times were steadily growing longer. To address this resource shortage, Congress created a program in which companies seeking to market prescription drugs paid “user fees” to the FDA to hire additional staff. In return, the FDA agreed to review products within prespecified timelines. PDUFA was a success in lowering review times, and has made the US a leader in getting innovative new drugs to market. In the years since the original Friends report comparing FDA and EMA review times was published, additional research corroborated the main findings. In 2012, The New England Journal of Medicine published research comparing drug review times across the FDA, EMA, and Health Canada. That study also found FDA review times to be faster than the other two regulatory agencies (median 50 to 60 days faster) and, importantly, found that this was the case for all drug reviews, not just in oncology. As we have shown (and others have confirmed), US regulatory reviews do not lag behind other global counterparts. However, given that our original research was published in 2011, we thought it appropriate to update our data to confirm that the trend still holds – that FDA still leads global regulatory bodies in the pace of its approval process. When we looked at the data from 2003 to 2016, we found virtually the same disparity in median review times as we did in 2011. When we looked at a related metric, market entry, we found that 97% of drugs approved by both FDA and EMA between 2003 and 2016 were available first in the US. Here’s a summary of our updated findings. In addition to the Washington Post, the Boston Globe’s STAT blog also used our data in their coverage of the issue. Although we don’t expect these findings to eliminate all calls to cut back on drug regulations, our research adds to a growing body of evidence demonstrating that the FDA’s current approach to drug regulation has been successful at both speeding patient access and safeguarding patient safety. As Congress moves towards reauthorizing PDUFA for a sixth time this July, it is worth revisiting these statistics to show just how successful the program has been.